Judging the reasons behind a European attempt to suppress Native American knowledge is a topic of vital discovery for understanding archaic history. 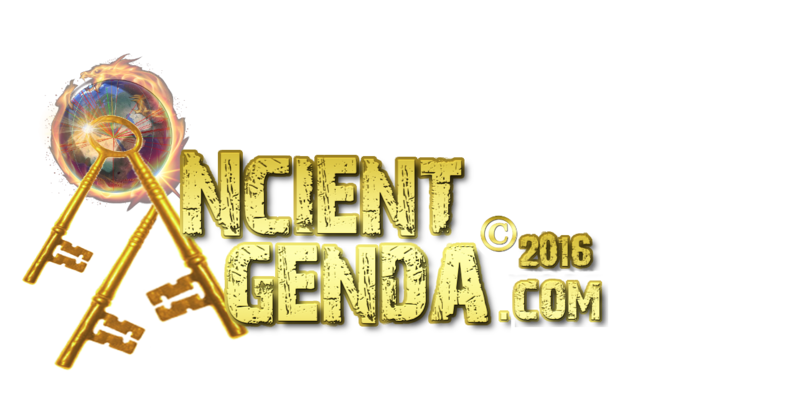 Ancient Agenda's CSI History investigators look high, low and wide to reveal ancient mysteries and present undeniable facts. As always we put the facts on the table for you the public - Judge and Jury to decide. Earth's reconstructed story is a long one. 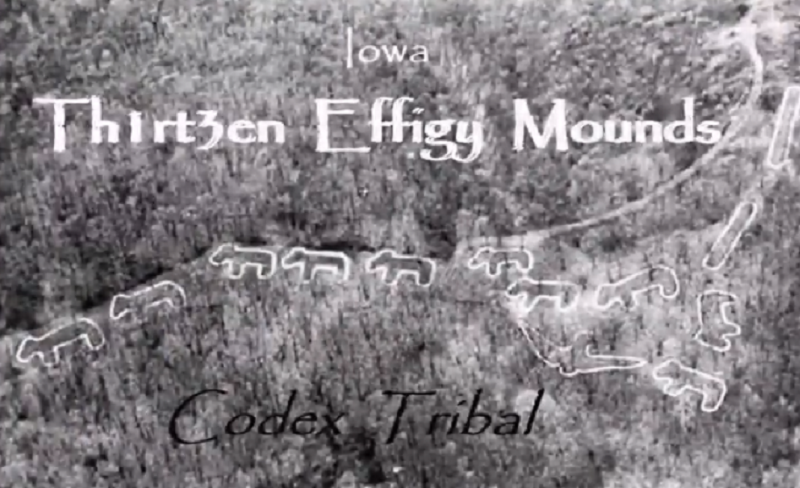 Here we are presenting rarely if-ever seen or realized evidences at North American Mounds. Tribal Codex part II will be Chaco Canyon and a select few surrounding 'sister' sites. We'll culminate this series with Petroglyphs, Medicine Wheels and various other rock art and structures. 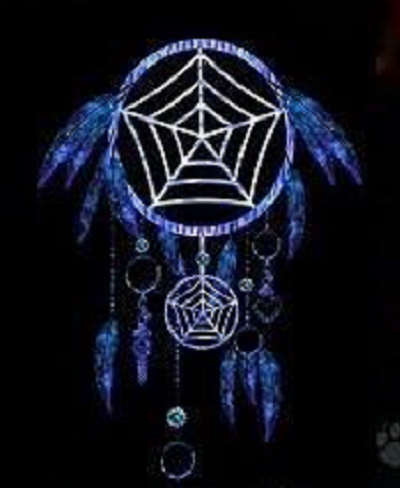 In a different article/series we will present the evidence as it pertains to the invasion of the Americas and what was at stake in the European conquest..who done it and why, looking at indigenous suppression bordering on an all out genocide of people, culture, ceremony, sacred places, knowledge and wisdom supplanted by western European religious dogma (15th to 17th century). 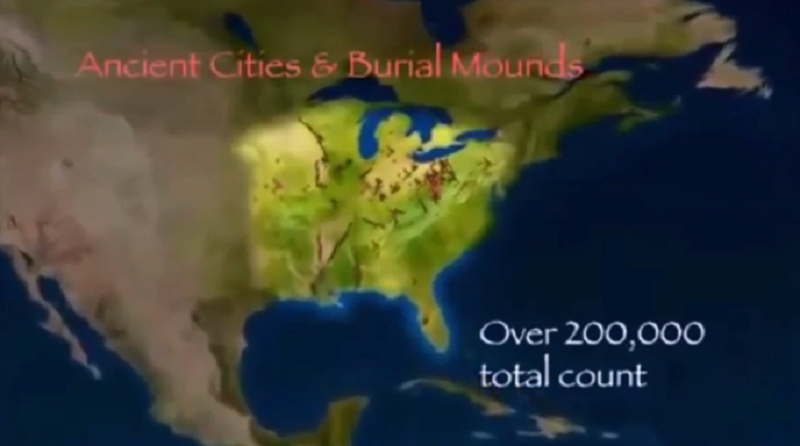 NA ancient cities and burial mounds numbered in total over 200,000, an amazing number unregistered still by many people today, include Natives. It was as recent as 1991 that the Director of the Smithsonian's 'National Museum of American History', historian Mr. Roger Kennedy was shocked to learn, for the first time that 'massive' ancient remains existed in North America. Likewise at least one President for the 'Society of American Archaeology' had never been to Cahokia – even by the time he had retired at age 70. Indeed most Americans were unaware that North America was dotted with advanced ancient architecture. Kennedy states “we now know there were more people in Cahokia than there were in London or Rome at the time”. The estimated and often argued total population of the Americas, pre-1492, is between 50 and 100 million, of that between 2 and 18 million in North America. Ancient Mound sites, simply lost to history, memory and vision or the result of 19th century political and scientific agendas? Oddly enough the ancient architectures were known 200 years ago. The young Mason George Washington undoubtedly had met the Indigenous Shamans, whom erected their sacred Tee-Pees with 13 ceremonial Poles, with Tee-Pee entrances facing Eastward. Did George face east when he laid the U.S. Capitol cornerstone in his loin cloth? The largest mound site George Washington visited was on the Ohio River and yet curiously he opened the Ohio Territory for frontier settlers to venture westward via his military without protecting or informing of these sites. As an unfortunate consequence many mounds were used as fill for small towns and villages as they sprung up and grew. This continued into the 20th century. At St Louis in 1904 in preparation for the World's Fair, 16 mounds were destroyed. At this time and era, St Louis' nickname was Mound City. 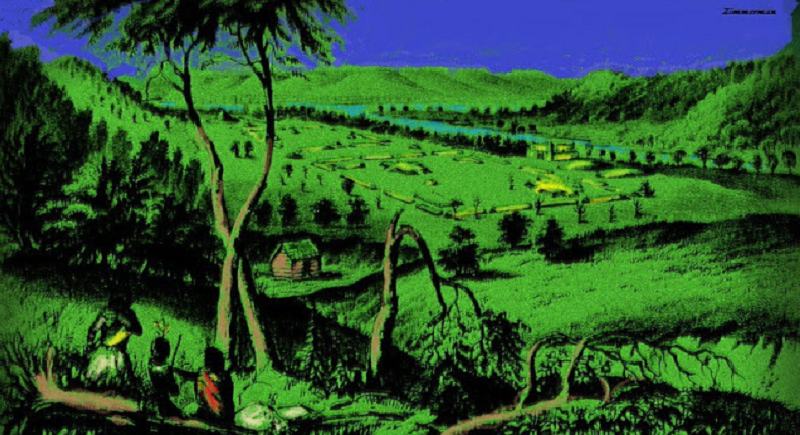 Likewise, Thomas Jefferson was personally well aware of large Earthworks in the Ohio Valley and thanks to Lewis and Clark he became aware of the largest Earthwork in the western hemisphere in the middle of the continent (Cahokia). 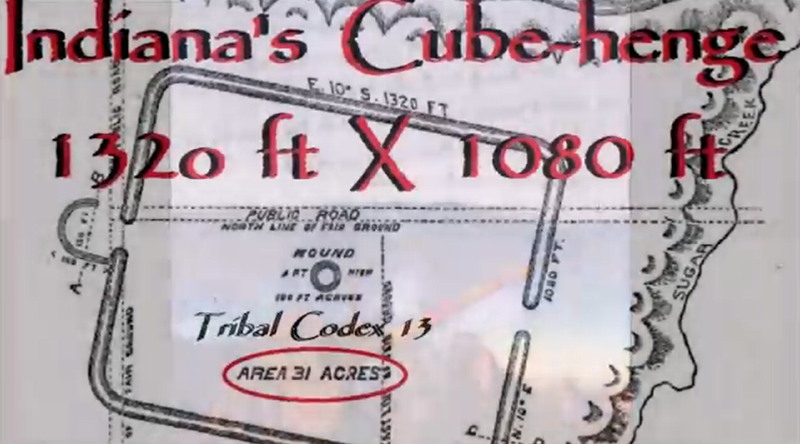 Were Lewis and Clark secretly sent on an ancient artifact-finding, ancient knowledge-discovery mission? Jefferson's passion was knowledge. 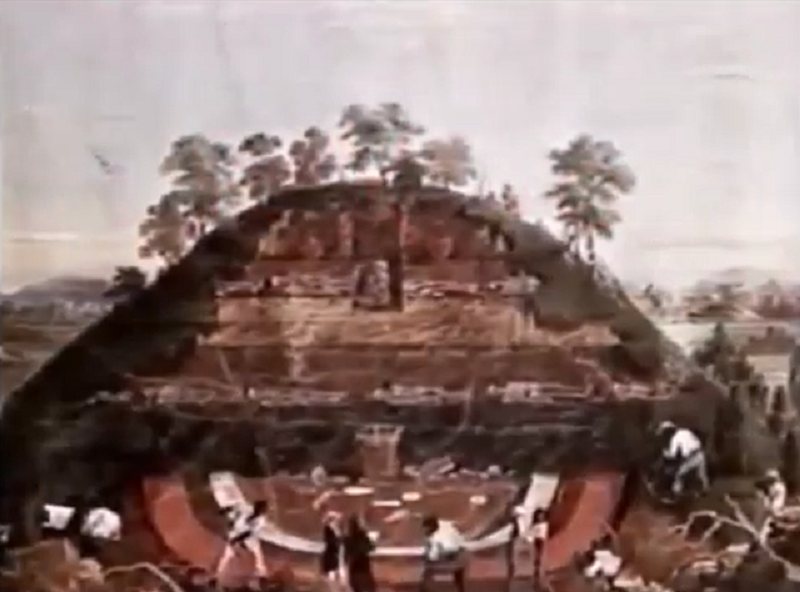 The sheer number of mounds had to point the Founding Fathers to the recognition of large populations on the lands they were about to confiscate. Of the modern day large cities on the Ohio and Mississippi river valleys only Marietta, Ohio somewhat retains its center-city mound identity. Marietta is also defined in other ways so in essence, culturally, the once mighty Mound Cities are gone. Since around 2012 there has been a push to build Mounds in Forest Park St Louis. Early archaeology by people like Atwater, Squire and Davis noted from the artifacts at the Mounds, that these were likely built by highly advanced cultures but eventually this knowledge went underground around 1920, except for prior publications which were somewhat hidden (and still today) in certain 'special' libraries....perhaps due in part to John W. Powell's paper to the Smithsonian regarding the proposal to limit presenting artifacts from Pre-Columbian periods AND his appointment in 1881 of Cyrus Thomas as the director of the 'Eastern Mound Division of the Smithsonian Institution's Bureau of Ethnology'. Shouldn't Americas heritage monuments have been protected, studied and presented to the public as they were excavated? Is this not our birthright to know..? Sorting fact from fiction requires astute investigators and sometimes being an academic has its drawbacks. When Thomas came to the Bureau of Ethnology he was a "pronounced believer in the existence of a race of Mound Builders, distinct from the American Indians." We are in fact in agreement with this statement and belief of Mr Thomas. 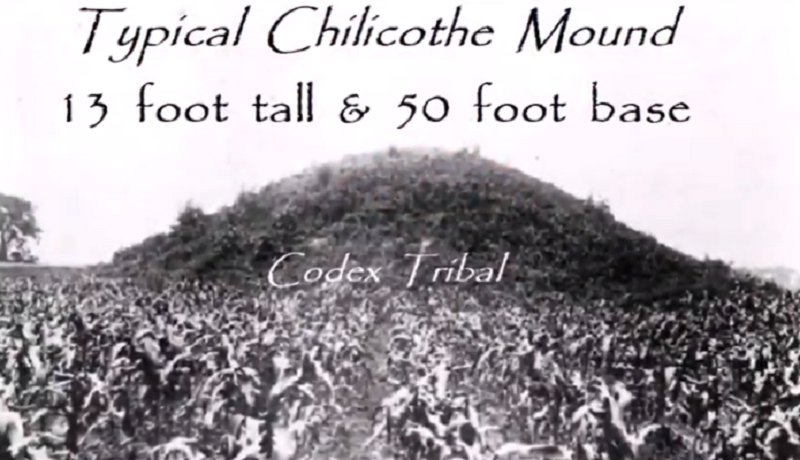 It is from this position that we respectfully put forth Tribal Codex: NA Mounds to all those who came before us and to all that will follow..
Mounds were made for solar alignments and astrological dedications. 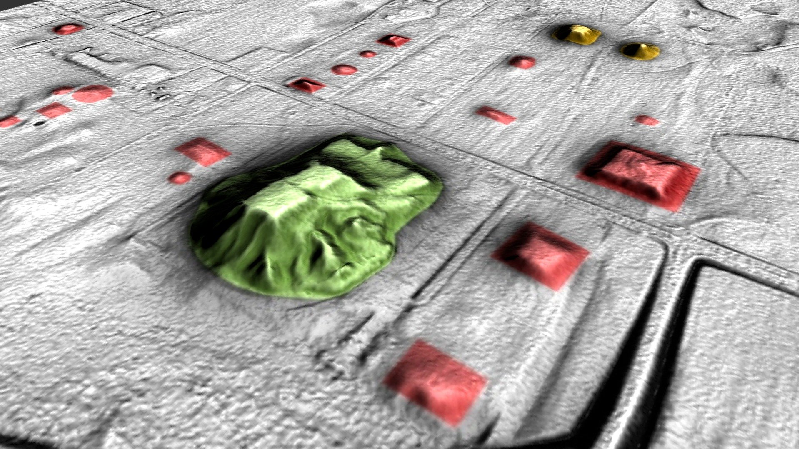 Long straight rectangular Mounds create 'horizons' for astronomical forecasting. 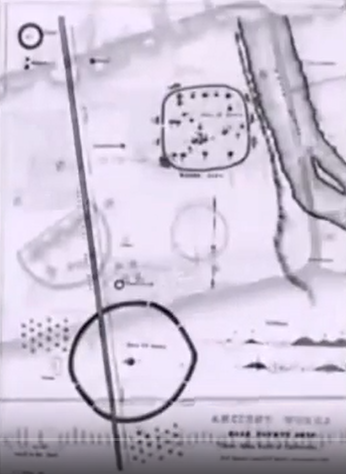 Round circular-hill Mounds 'capture' astrological arrangements. Woodhenge's project the identical solar practices as Stonehenge's astrolabe, establishing Lunar and Solstice/Equinox knowledge. 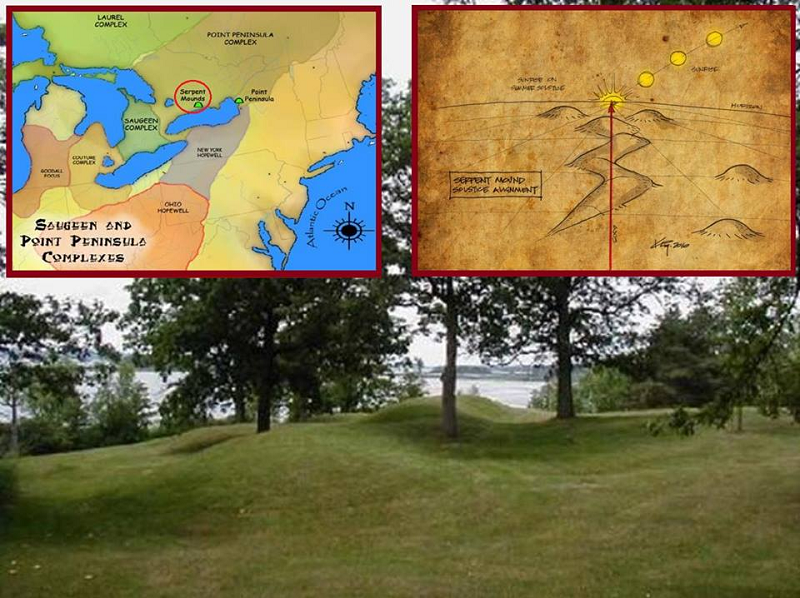 Hopewell Earthworks sites were nominated by the U.S. Interior Dept for World Heritage status on May 25, 2018 to be included among sites like Grand Canyon Arizona, the Pyramid fields from Giza to Dashur, Egypt; Machu Picchu, Peru; the Taj Mahal of India and Galapagos Islands, Ecuador. Hopewell calculates the full 18.6 year Lunar cycle. 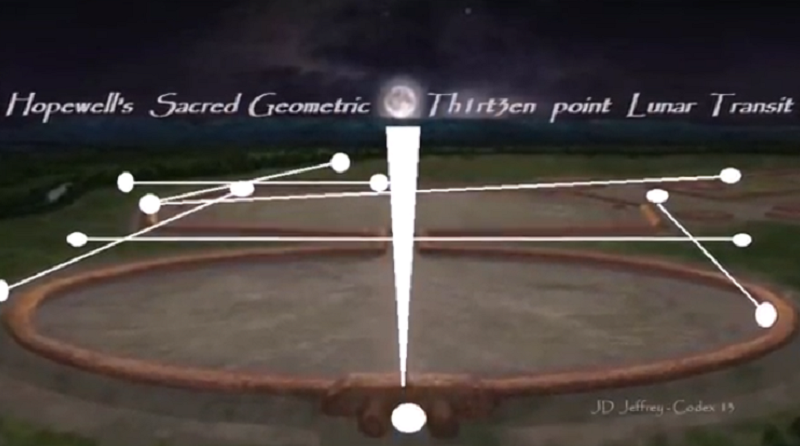 It lays out maximum-minimum Lunar rise and set points..showcasing Hopewell's sacred geometric Th1rt3en point Lunar Transit. The earthen created geometrical banks at Hopewell's astrological center incorporates a highly advanced unique octagon Lunar astrological center to calculate and establish long term Lunar practices. The long rectangular banks are created as a 'false horizon' for accurately sighting the circular oblong motion of our Moon around Earth. This enables the full calculation of 18.6 years during a 13 month lunar year calendar. 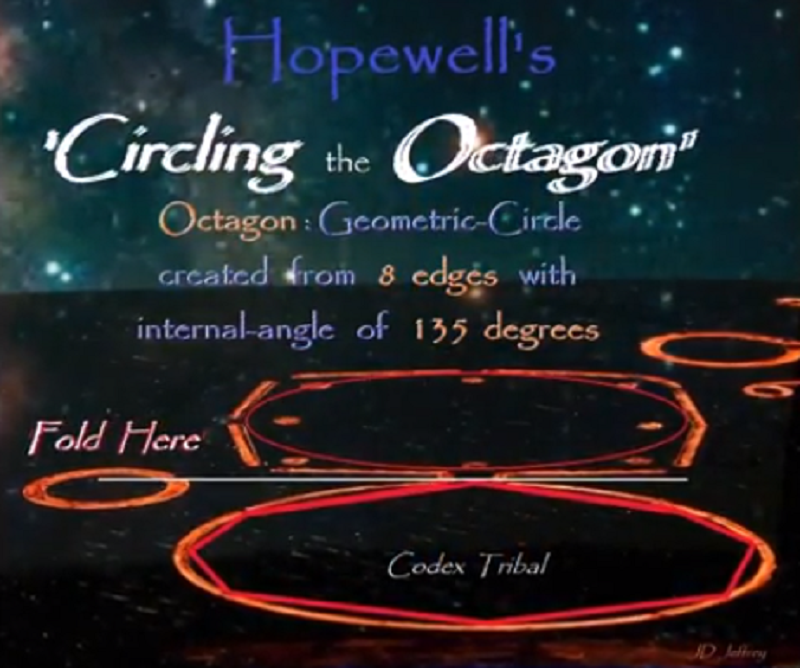 Hopewell's most esteemed mounds are the connected great Circle and Octagon. 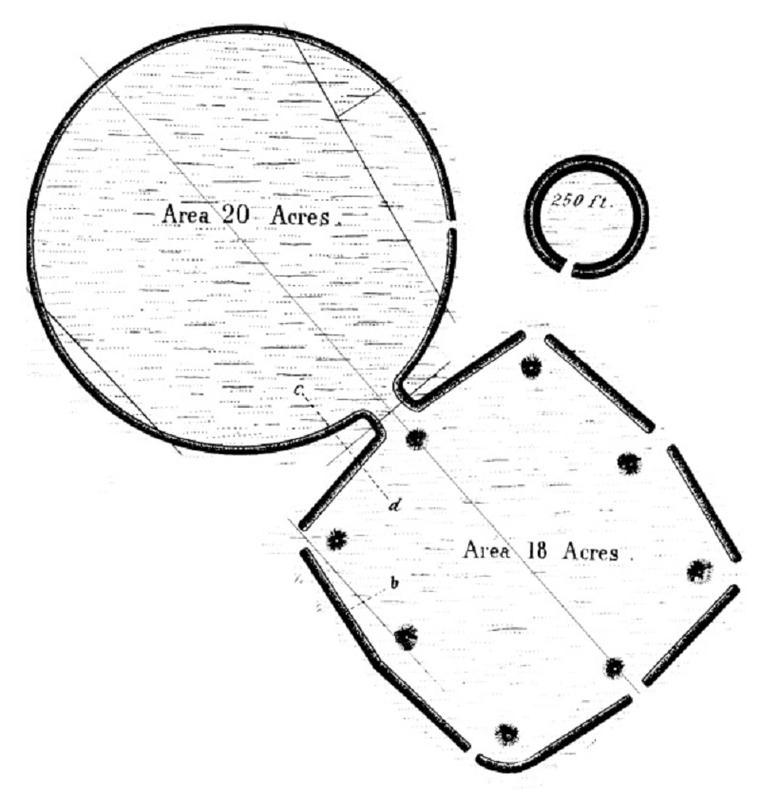 The great-circle encloses 5 to 13.5 foot embankments (30 acres). A ditch measuring 8 to 13 feet deep runs inside the perimeter of the great circle. The Octagon has Eight internal points where two squares can be inserted/overlaid via alternating points. Within the square whose center axis-point is 51.8 degrees east of north four smaller squares can be drawn. 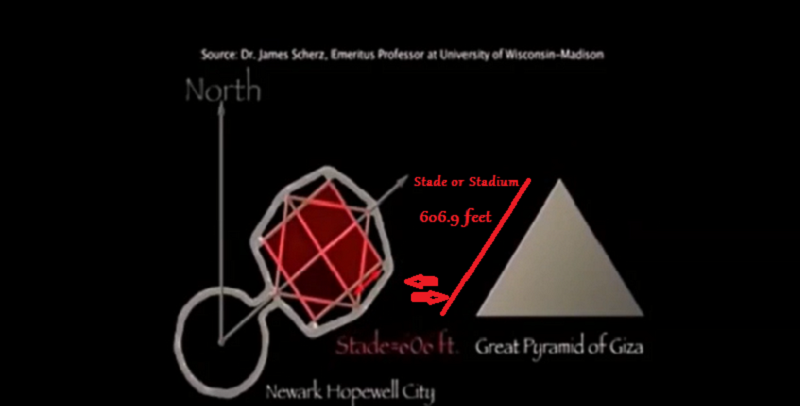 A Greek/Roman measurement known as a 'Stade or Stadium', is 606.9 feet (6+6+.9=12.9 or 13). 606.9 feet is 184 meters (1+8+4=13). 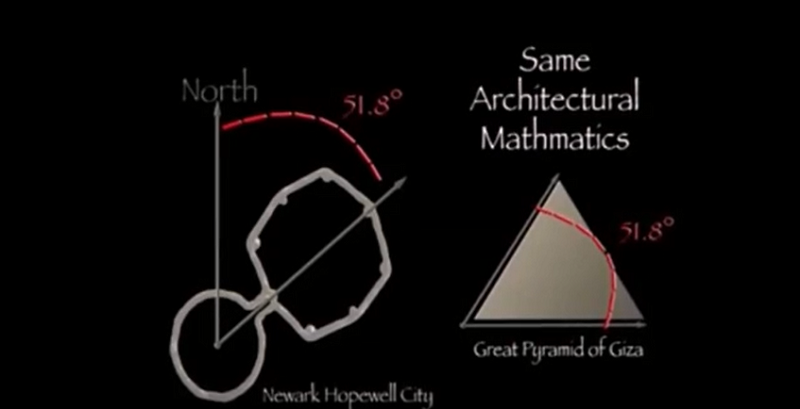 One of the small inner squares is One Stade (below left image), which equals the side-slope length of the Great Pyramid's angle of 51.8 degrees. High-Bank Mounds align Lunar minimum and maximum 'standstill Moonrise and Moonsets' as well as 'Solstice Sunrise and Sunsets'. 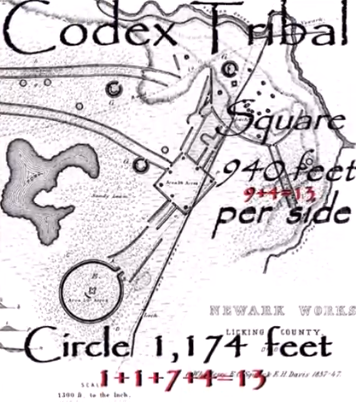 We find this same example exemplified at locations such as Newark's great Circle with Octagon Mounds. High Banks to Newark is 58 miles (5+8=13). Newark to Wright is 35 miles [3+5=8]. Wright to High Banks is 57 miles. (58+35+57=150 miles, 150mi=241.402km, 241.402 reduces to 13). High Banks great Circle is 20 acres = 8 Hectares. From center of great circle through opening points to center of smaller circle with a 250 foot diameter (250ft is 76m, 7+6=13). Mound City Group is the only fully restored Hopewell earthwork complex. As such, it is a national treasure. Here, visitors who walk quietly through the enclosure and among the mounds can still experience a sense of what it may have been like to gather at a Hopewell ceremonial site two thousand years ago. 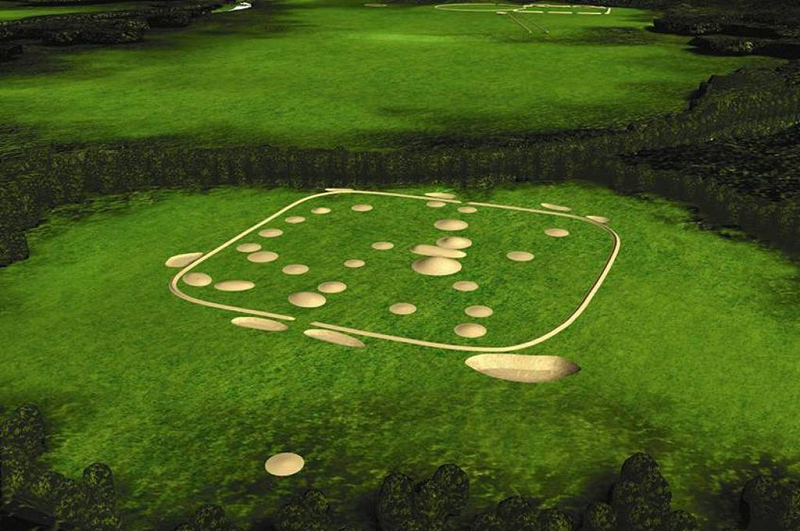 This earthwork consist of a 13-acre rectangular earth enclosure with at least 23 mounds. The height of the earth walls of the enclosure is about 3 to 4 feet, with an entrance or gateway on both the east and west sides. All the mounds are dome shaped except for one that is elliptical. The largest mound of the group was described by early explorers as 17.5 feet high [5.3m, 5+3=8] and 90 feet in diameter [27.4m, 2+7+4=13]. There are two additional mounds just outside the enclosure. All the walls and mounds have been reconstructed and are clearly visible. 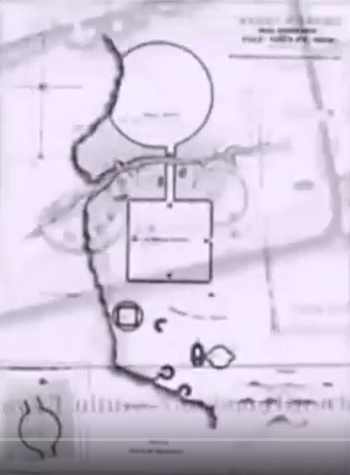 The Wright Earthworks consist of a fragment of a geometrically near-perfect square enclosure and part of one wall that originally formed a set of parallel embankments, which traveled from the enclosure to a large oval yard. The Newark square's sides formerly ranged from about 940 feet (290 m) to 940 feet (290 m) in length [9+4+13], enclosing a total area of about 20 acres (8 ha). Th1rt3ens everywhere... diagonal diameter is 328 feet (3+2+8=13), at a heading of 42.34 degrees (4+2+3+4=13) - southwest to northeast (winter Solstice sunset). Ephraim George Squier and Edwin Hamilton Davis visited the site in the mid 1840s. They would discuss their survey in their 1848 publication Ancient Monuments of the Mississippi Valley. They describe the location of the work as occupying a "narrow spur of land,". They describe the design of the work as a Greek cross. The work was three feet high and 90 feet apart (90 feet = 27.4 meters, 2+7+4=13), on each end and closely matches the cardinal directions. A small ditch surrounded it, following the design of the cross. In the middle of the cross was a circle shaped depression. 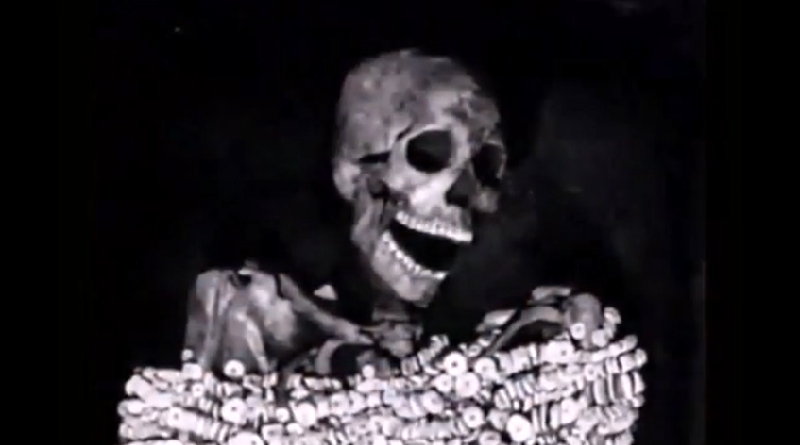 The depression was noted as being 20 feet in diameter and 20 feet deep. Towards what they describe as the "back" of the cross was "a small circular elevation of stone and earth." 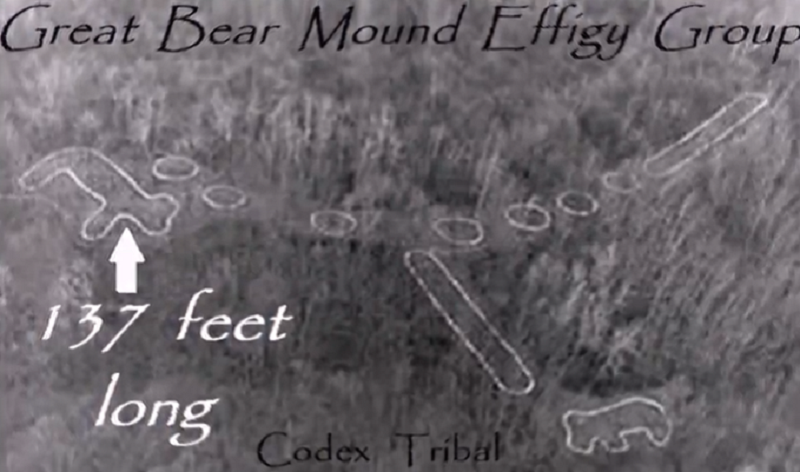 One of the many enigmatic effigy mounds in southern Ohio. 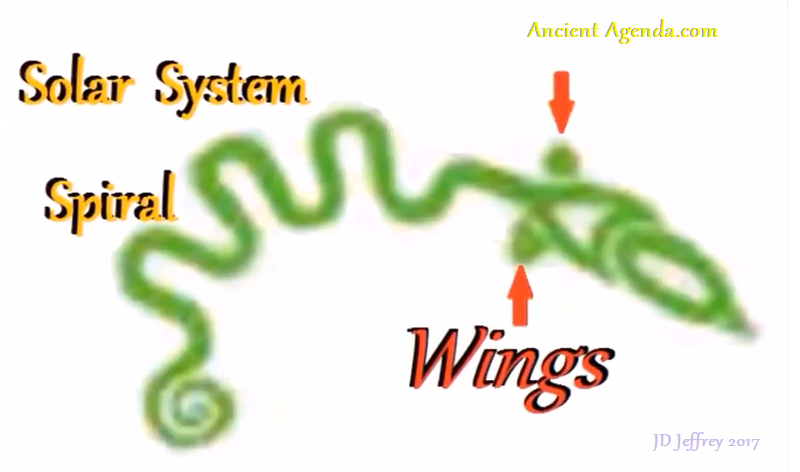 Serpents Winged Disc Sound of Silence ..
Video reveals a link between Serpent Mound and other serpent effigies. 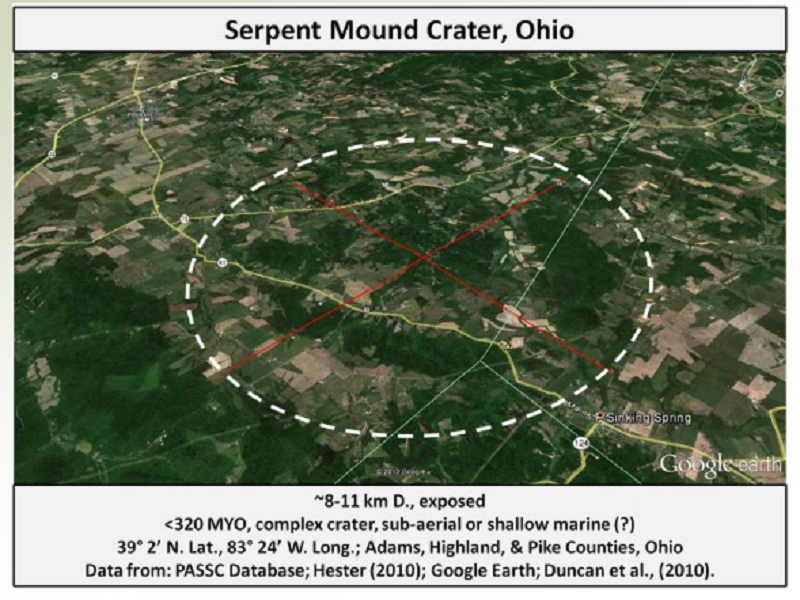 Is the Serpent on this Mound delivering a panSPERMia message, as it overlooks it's OVUM comet-crater? 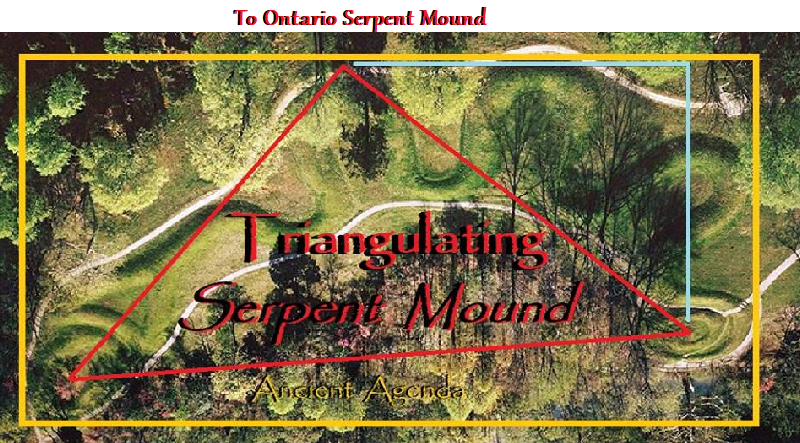 Serpent Mounds National Historic Site of Canada is located in an open oak savannah setting on Roach’s Point and East Sugar Island in Rice Lake, Peterborough County, Ontario. Traditionally recognized as a burial site dating from 50 BCE to 300 CE, it is a grouping of Eight separate burial locations forming a serpentine shape that is approximately 60 metres long and almost 8 metres wide, also registering a height between 1.5 (4.9ft, 4+9=13) to 1.8 metres high. 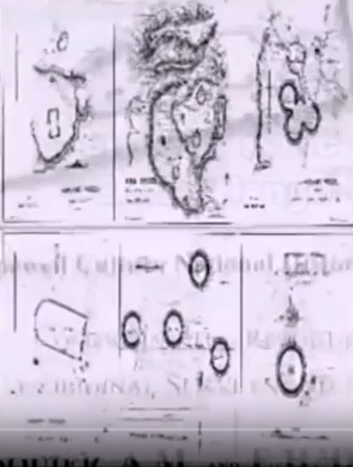 Serpent Mounds incorporates a 4.4-hectare area [4+4=8] on Roach’s Point, as well as a 49-hectare area [4+9=13] on East Sugar Island. 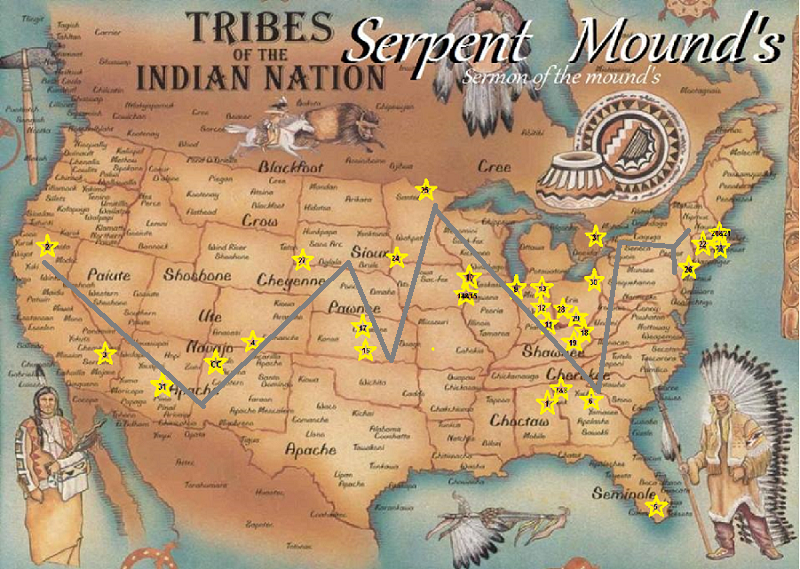 Originally created, North America is home to 31 Serpent mound/effigies. 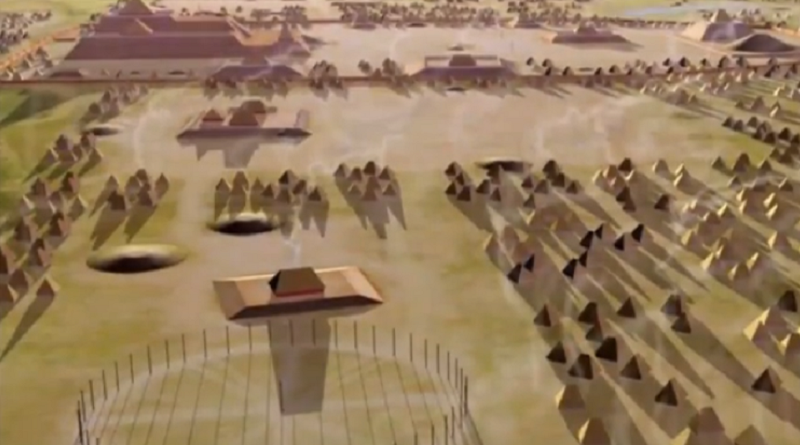 Cahokia is the largest North American continent Mound site and the largest world-wide earthen pyramid known as Monk's Mound. This Mound is centered on 13.9 acres (13.9 = 1+3+9=13). 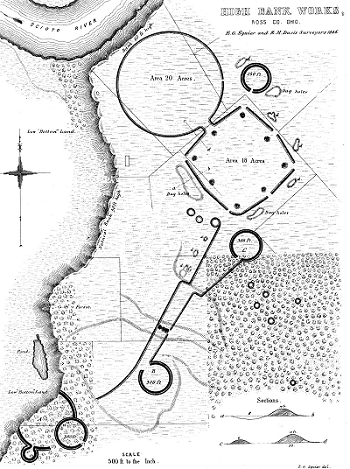 The site is aligned 5 degrees East of North forming a central-axis point 58 foot (5+8=13) wide elevated road extending 1 kilometer through the 'center' of Cahokia City. Monk's Mound is constructed with 814,000 cubic yards of fill (8+1+4=13). 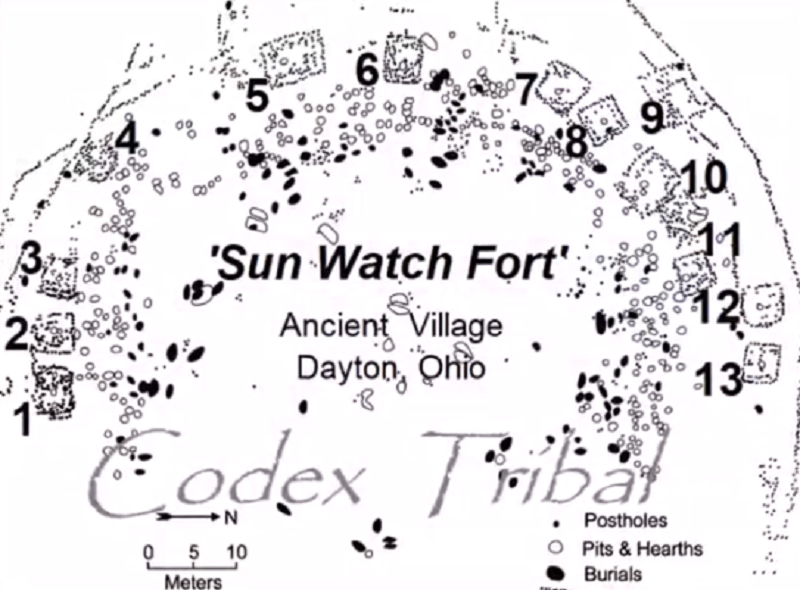 Cahokia's Woodhenge Astrolabe is 850 meters (8+5=13) from the center of Monk's Mound. 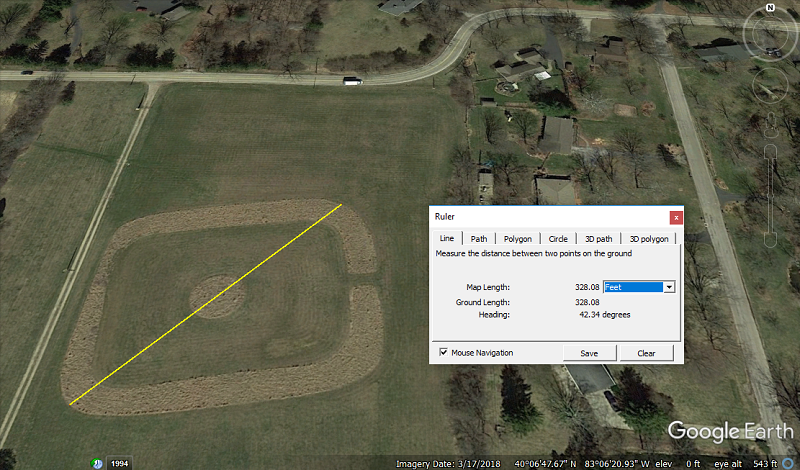 Likewise a large square mound is 1480 feet (1+4+8=13) Southwest from Monk's Mound. As seen from the Grand Plaza South of Monk's Mound, the great city of Cahokia calculates Luna's full 18.6 year Lunar Transit. 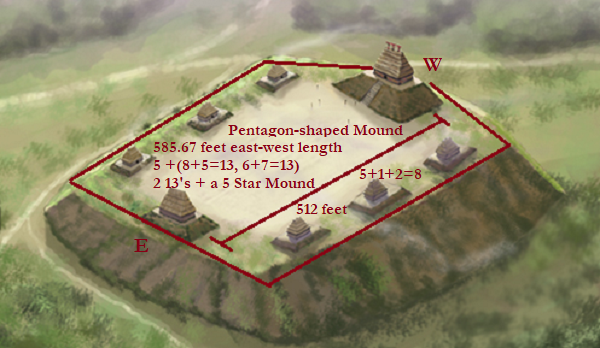 Located 8.5 miles (8+5=13) from the Mississippi river in southwest Mississippi, Emerald Mound reaches a height of 35 feet (3+5=8, 8 imperial=13 metric) base. It's built upon 8 acres once housing 8 mounds. The mound measures 770 feet (230 m) by 435 feet (133 m) at the base. 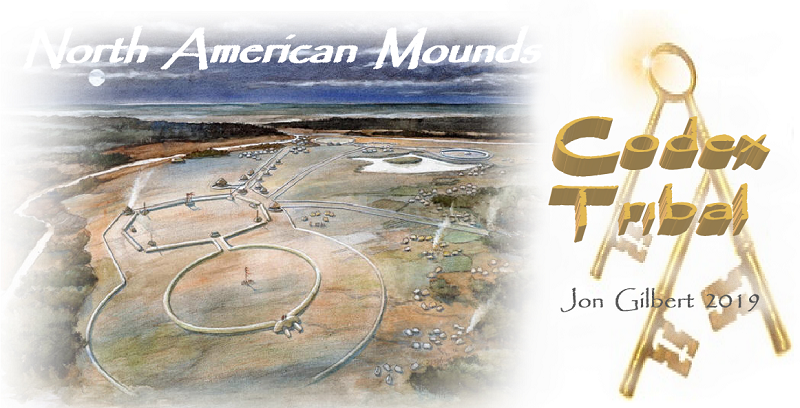 The larger of the two platform mounds atop the main mound sits at the western end, and measures 190 feet (58 m, 5+8=13) by 160 feet (49 m, 4+9=13) at the base and is 30 feet (9.1 m) in height. 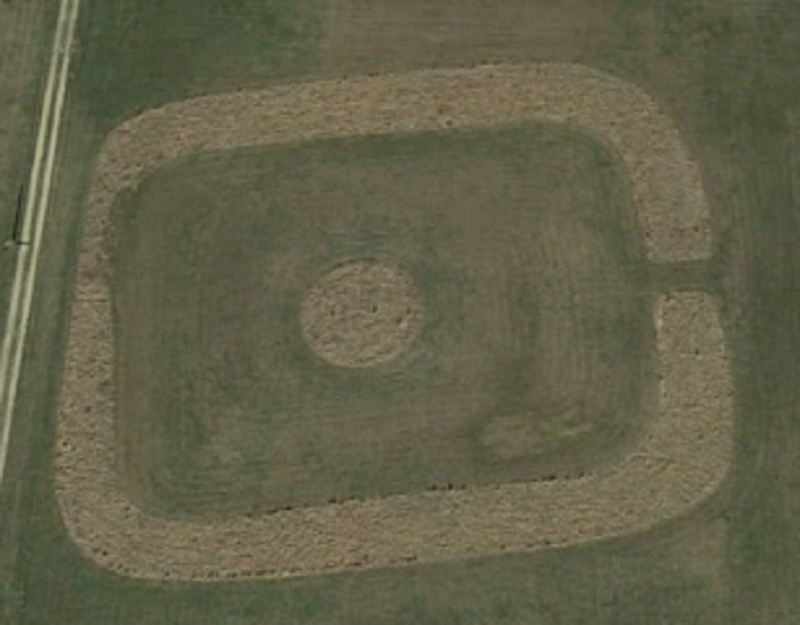 This Mound was fashioned in a distinctive 'Pentagon' shape. Starting with the master we have the Circle. 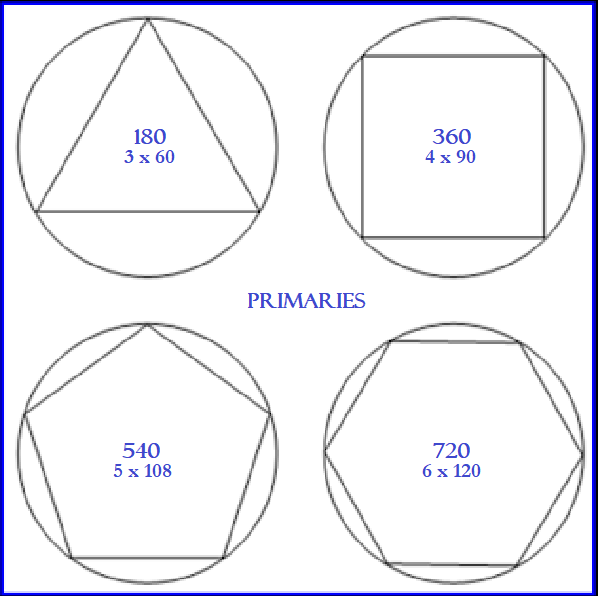 From there the three sided Triangle, the four sided Square, the five sided Pentagon and the six sided Hexagon are the Primaries. Three, Four, Five and Six forms give us the basis for Sacred Geometry. Circling the Square is a term within geometry and can be seen at various global archaic monument-sites. 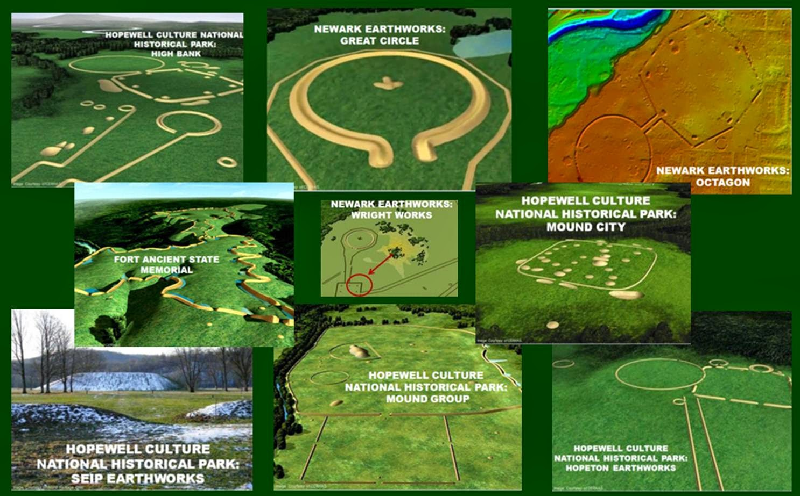 Unique to this concept is 'Circling the Octagon' found only in North America at areas such as the distinguished Newark Earthworks. 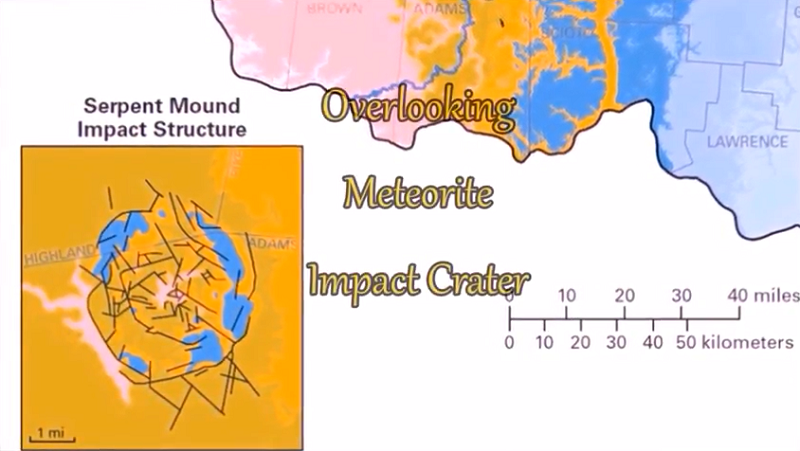 Through a quick topographical review of Mounds, it's easy to distinguish the advanced geometry expression detailing a higher knowledge involving math and astronomical precisions. Many Mounds contain rows with 13 sacred remains. Various mounds across North America, when excavated, documented remains stacked in levels containing a total of 13 bodies. The most complete reference for these earthworks is 'Ancient Monuments of the Mississippi Valley', written by Ephraim G. Squier and Edwin H. Davis. It was published in 1848 by the Smithsonian Institution. 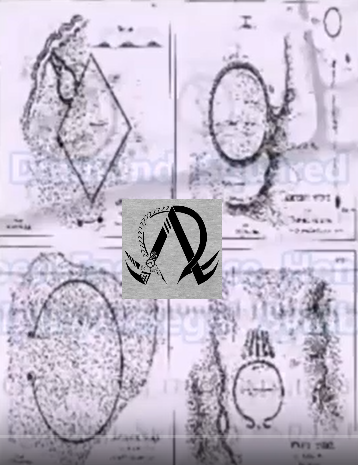 Since many of the features which the authors documented have since been destroyed or diminished by farming and development, their surveys, sketches, and descriptions are still used by modern archaeologists. All of the sites which they identified located in Kentucky, came from the manuscripts of C. S. Rafinesque. Maturin Le Petit, a Jesuit priest, met the Natchez people as did Le Page du Pratz (1758), a French explorer. Both observed them in the area that later became Mississippi. The Natchez were devout worshippers of the sun. Having a population of some 4,000, they occupied at least nine villages and were presided over by a paramount chief, known as the Great Sun, who wielded absolute power. Both observers noted the high temple mounds which the Natchez had built so that the Great Sun could commune with God, the sun. His large residence was built atop the highest mound, from "which, every morning, he greeted the rising sun, invoking thanks and blowing tobacco smoke to the four cardinal directions". Later explorers to the same regions, only a few decades after mound-building settlements had been reported, found the regions largely depopulated, the residents vanished, and the mounds untended. 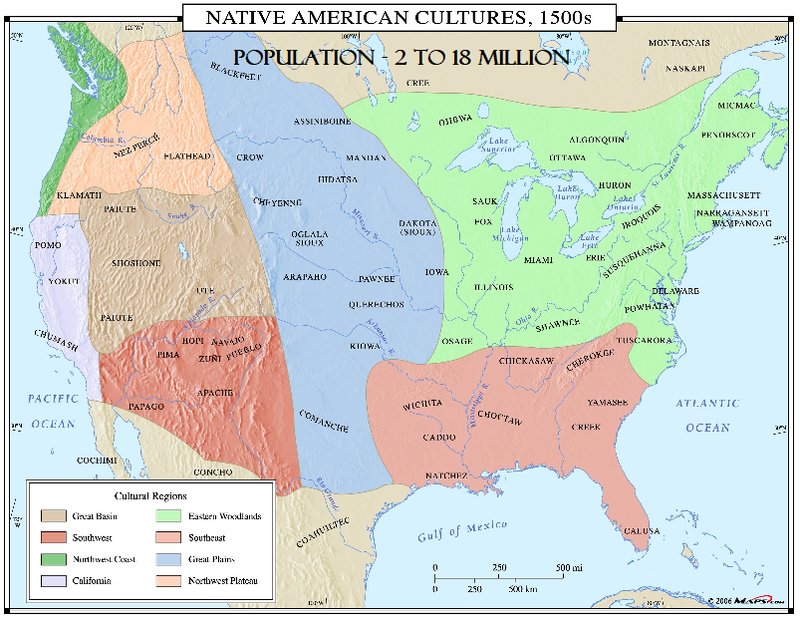 Since little violent conflict with Europeans had occurred in that area during that period, the most plausible explanation is that infectious diseases from the Old World, such as smallpox and influenza, had decimated most of the Native Americans who had comprised the last mound-builder civilization. Uniquely, North America's One-Hundredth Meridian equally divides Mounds, artificial Horizons and Woodhenges on one side; Petroglyphs and Rock art with Chaco Canyon are located on the other side. 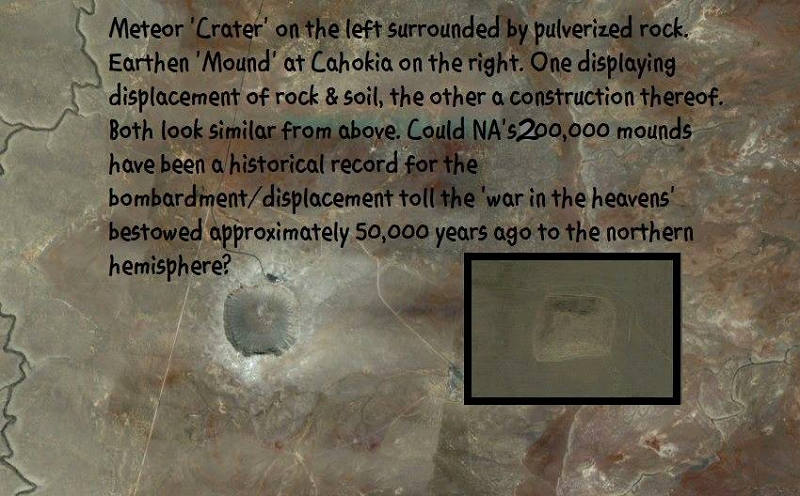 To the West of the 100th Meridian, located in Northern Arizona, is Meteor Crater also known as Barringer Crater. 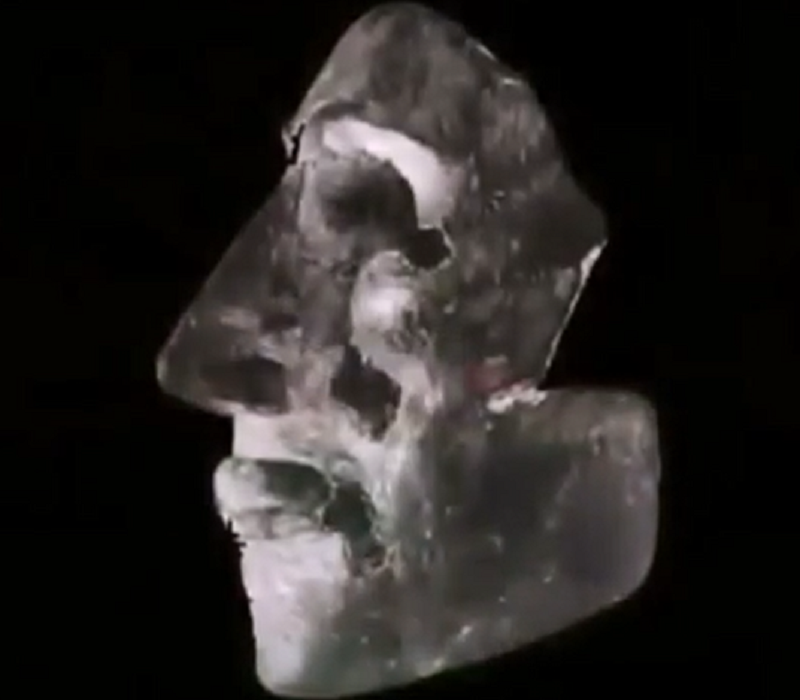 It's believed to be 50,000 years old. Meteor Crater to Wupatki Ruins is 39 miles: 3 x 13=39. Distance from Barringer Crater to the prestigious Chaco Canyon is 184 miles. A very curious 13 from adding 1+8+4. 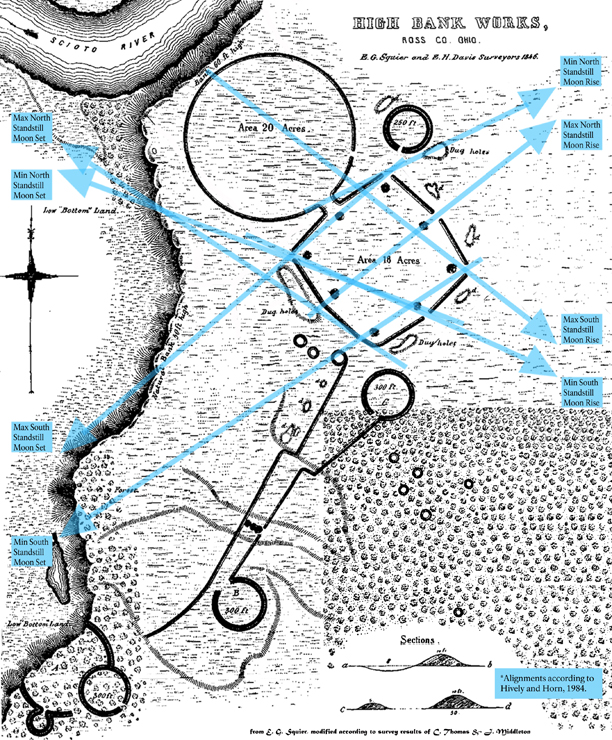 Might it be hypothesized and realized that the forgotten message of North American Mounds are more than merely great works of astronomical wisdom; that in truth they represent the knowledge to a cataclysmic episode not just in North America's past, but our global history, written in advanced geometrical symbology.